When your company name makes reference to crappy weather, you better be able to make a damn good rain jacket. Well, Showers Pass is a company dedicated to making inclement weather bearable and the Refuge model that you see here more than qualifies as "good". In fact, it's the best jacket I've tested all season and that's saying a lot. We've tested some top notch models, but the Refuge still shines. Despite dozens of rides in horrible conditions, the Refuge has yet to spring a leak. 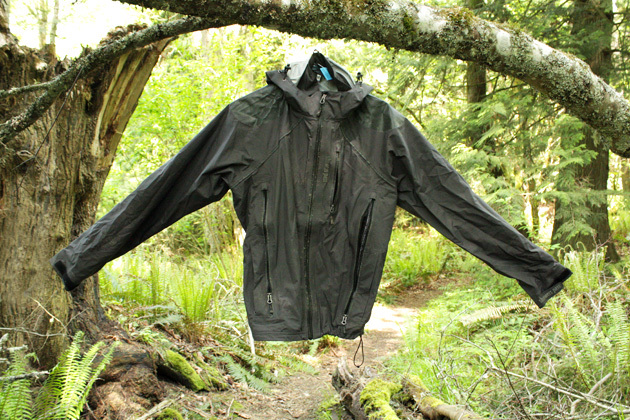 This is one waterproof jacket that lives up to that designation. The fully seam-taped jacket is made from a triple layer, waterproof-breathable hardshell fabric that sheds water like nobody's business. While the jacket material doesn't have as soft and comfortable a feel as some of the other jackets we've tested, it has a reassuring rugged quality—sort of like an athletically-inclined version of Carhartt. The Refuge is also equipped with reinforced shoulders, which should hold up well to the constant friction and wear and tear of hydration pack straps. It's a clever touch. 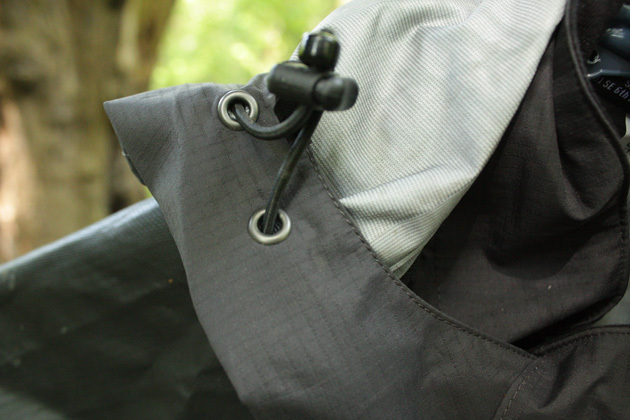 Showers Pass chose to go with massive YKK Aquaguard zippers, which are a blessing as they give you a bit more leverage with which to get the fully sealed zippers up and down. It sounds like a small detail, but most rain jackets come with sadly miniaturized zippers that are hard to grip with gloved hands and just don't exert enough force on sealed zippers. Kudos to Showers Pass for going big. Showers Pass has designed the Refuge to be extremely adjustable. To that end, you can fine tune the fit via the Velcro wrists and drawcords at both the waist and hood. The jacket's overall fit is more relaxed than some of the other performance riding jackets, so you'll definitely find yourself cinching up the waist. Speaking of adjustable, the Refuge comes with some massive venting zippers that run up and down your trunk. 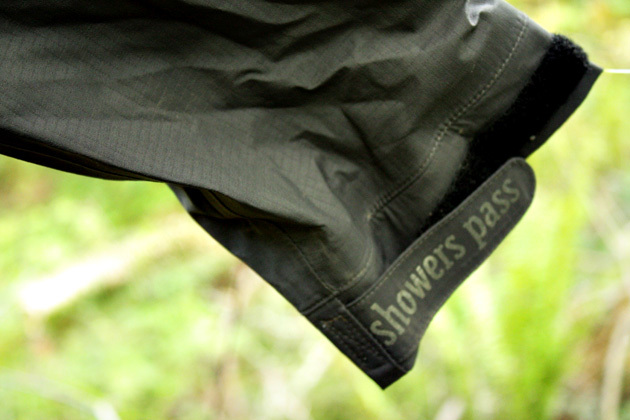 Showers Pass touts its fabric as being "breathable", but they went the extra mile and added substantial mechanical venting on the jacket. I'm a big fan of that decision. Too often, companies rely on their high-tech fabric to do all the heavy lifting when it comes to "breathing" and keeping you from overheating. As impressive as some of the latest fabrics can be, no jacket breathes so well that it can do without vents—not if you're truly hammering the pedals or grinding up sustained climbs. So, again, hats off to Showers Pass. The Refuge comes equipped with a hood—if you're not feeling the love for it, you can easily unzip it and let your head go commando. The jacket features extensive reflective highlighting. The reflective material is not obvious at first glance, but if you shine a light on the Refuge, it lights up a like a Christmas tree from damn near every angle—a real plus for anyone who commutes or pedals the road to the trailhead. Finally, the Refuge features plenty of storage room—two front pockets, a chest pocket (with headphone port) and a back pocket. Nice. If this review sounds like an unmitigated love letter to Showers Pass…well, I guess it does. The Refuge merits that kind of sloppy-kiss praise; it's simply an outstanding piece of kit. Of course, the jacket should be great given the price tag, but this is a case of getting what you pay for. If you ride in the rain and are hard on your equipment, it's hard to do better than this.